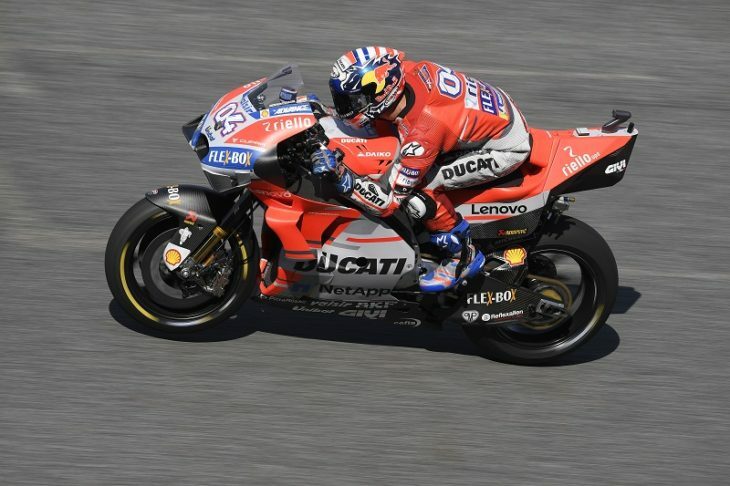 Andrea Dovizioso headed the field at the end of the first day of free practice for the Thailand Grand Prix at the Buriram circuit in the noth-east of the country. The Ducati Team’s Italian rider, third this morning, set the quickest time of the day in the last few minutes of FP2, lapping in 1’31.090. Jorge Lorenzo, whose right foot was still in pain this morning when he took to the track for the first time following his Aragón crash, finished FP1 in seventeenth place but unfortunately crashed out again with a high side at Turn 3 during his second run. Jorge was immediately taken to the circuit medical centre where he was diagnosed with having abrasions to his right forearm and bruises to his left wrist and the right foot he already injured in Spain. The Mallorcan rider then went to the local hospital to have further checks on his left wrist, but was in any case declared fit for tomorrow by the organizers’ medical staff.